Dozens of novels and many films have given the French Foreign Legion an adventurous and dashing air, and whether justified or not this has made the early 20th century legionnaire one of the most recognisable of history's soldiers. Airfix were well tuned to popular culture, and this set was among the first historic figure sets they produced, over half a century ago. Well OK, this particular set is not that old. This is the second type set, and it was the first type that appeared in 1962 (reviewed here). This set was a retooled and much improved copy of the first, and appeared in the late 1960s. The poses were almost identical, but the standard of detail and quality of mould were a great deal better. 16 poses is pretty good for an infantry set, and these are a fair collection. Several make regular appearances in many Airfix sets, particularly the American Civil War, and for the most part they are quite acceptable. It is difficult to know what the man holding his rifle directly over his head is meant to be doing (parrying a downward blow from a sword? ), and the man holding his rifle barrel pointing down is also something of a mystery, though he may be using it as a club. The officer holds both sword and revolver at the same time, the latter in his left hand, so presumably he is ambidextrous. Still this is a dramatic but pretty unlikely pose in reality, so not a great choice here. All the men are in campaign dress with the heavy 'capote' coat and the loose trousers. Sadly the uniform has a number of inaccuracies and several missing components. Briefly, the canteen is a round affair reminiscent of the British Napoleonic type when it should be the two-spout bidon, the men have only one ammunition pouch when they should have one either side, and they are missing the Y-straps to support these over the shoulder. There is no sash under the belt - a proud symbol of the Legion - and no mess tin or haversack anywhere. The coats have a falling collar when this should be standing, and all the men wear gaiters, little seen by 1906. The officer's revolver holster is extremely uncomfortably placed on his stomach, and the mounted officer has a canteen with no visible means of support (they did not hang from the belt). Finally, no-one has fixed bayonets, which may not be an error but is certainly a surprise. The dismounted officer wears a capote like his men, but at this period it appears that officers would not wear this item, but a vareuse or similar tunic as depicted in the Esci set. So he should appear more like the mounted officer here. Though a step up from the first type, detail is still not impressive, with weapons in particular being largely smooth bits of plastic that are no more than rifle-shaped. The officer's horse fits into an incredibly thin base using four very short pegs (naturally), so that even though all four legs touch the ground it is difficult to keep base and animal together. Some issues of this set have also suffered loss of detail on the horse, virtually losing the saddle and cloth altogether. The amount of flash varies, with later reissues having more than the original batch. Some very realistic (and a few less realistic) poses and good anatomical appearance fail to compensate for the poor attempt at historical accuracy. 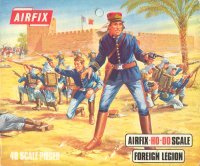 Esci have produced a much better researched set, so maybe it is time for Airfix to produce a third, definitive version of this set with modern levels of detail and a more authentic uniform.